The Main Nile encompasses the downstream river reach, starting at the Blue– White Nile confluence at Khartoum. 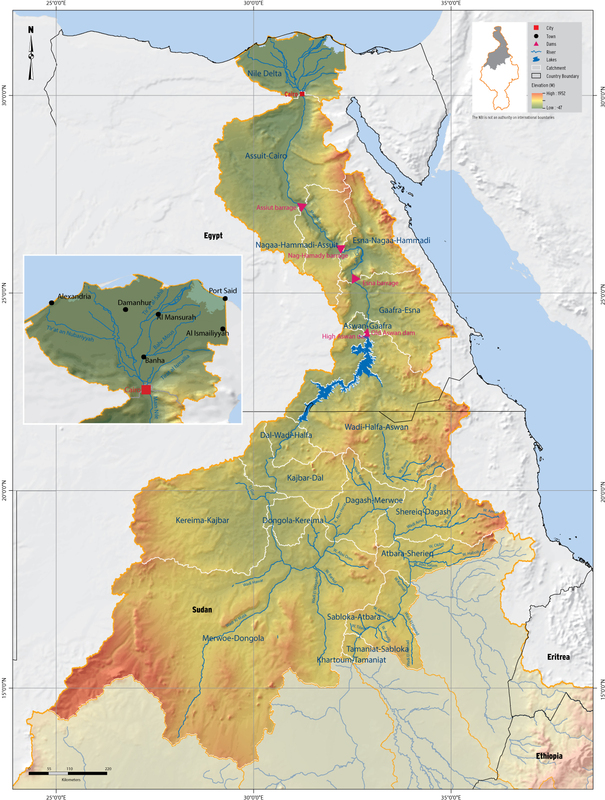 The Main Nile system, divided into two distinct sections – Main Nile in Sudan upstream of the High Aswan Dam; and Egyptian Nile below Aswan, including the Nile Valley and Delta. This large area generates virtually no runoff, and in-stream evaporation results in a net loss. The average annual precipitation in the sub-basin is 198mm and average annual potential evapotranspiration is 2,206mm. River flow in the lower reaches is controlled by Lake Nasser, which is subject to considerable evaporation losses. Most river flow is diverted to the irrigation schemes in the north of Sudan and in Egypt, and very often most of the river discharge into the Mediterranean is drainage and re-used water.